Konstsmide silhouette welcome light is an enchanting take on the traditional version. 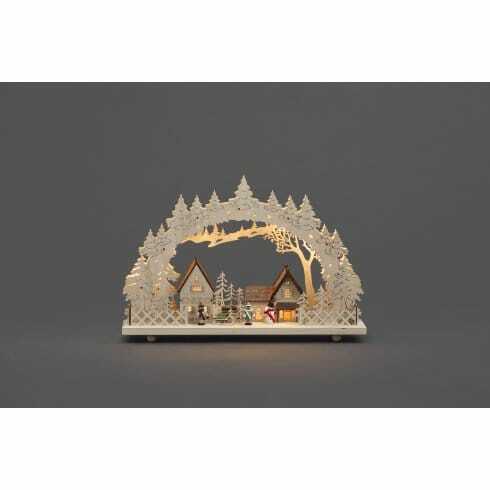 The arched forest design frames the whole winter motif village scene beautifully, and a warm glow is added when the light is switched on as 10 warm white LED's illuminate the decoration in a very subtle way. A must have addition to your Christmas decor this season. As it's sure be a popular choice, get your's early to avoid disappointment. To add flexibility this captivating decoration can be either battery or mains operated. Please note that batteries are not included. For indoor use only.